I did my first race of 2017 today, a cross-country race of 5886m (6km & 51m/D+ per Strava) – Championnat de l’Essonne de Cross. I did not know that I was going to do this race until 4 days ago. During the training session, my coach approached me to ask me to be a back-up for the running club’s female team of four. They already had a team, but would like me to join the race, in case one of the members became injured. I had previously declined to register for that race because, regardless of what people say about how much they love running, racing is basically self-torture. Being a back-up is certainly not flattering. However since the coach asked, and I did not want them to risk losing the opportunity to form a team to win the team category, I accepted the request. Selfie is a must. Silviu, who has just recovered from an injury, did not race today, but he still came and supported me. Back in my days in Hong Kong, I would join 100km ultra-distance races which would normally mean spending at least a night out on the trails. Obviously, spending sleepless nights on the trails could not be categorised as “fun.” In extremely short races such as the Cross, the duration of the torture is minimal (minutes as compared to nights out on the trails), but the intensity shoots up. In an ultra-distance, pacing plays a key part in winning (for the elites) and finishing (mid-packer like me (in HK); relegated to the bottom 30th percentile in France). As such, trail runners usually start out and continue at a slower, but sustainable pace. 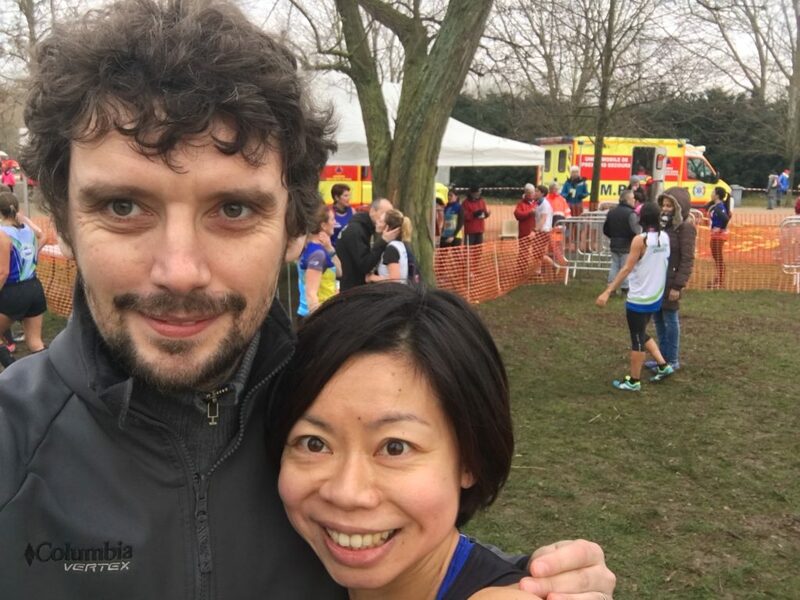 On the other hand, runners in the Cross are expected to dash to the finishing line, right from the “Bang.” I did my first cross-country two months ago in November: a short race of 5.3km during which my throat raged and my lungs almost burst throughout the 28min it took me to finish. Today, the extremely muddy terrain coupled with my inadequate trail shoes (I did not buy any spike shoes as I had not expected to do another cross after the one in November) did not help to improve my racing experience. Two bright spots: I did not fall flat on my face while trudging through the mud and I wasn’t the last one (61th/101 & 32’20”. Fastest:23’19”). Moreover, things went well for the female team and they won the team event!